Freshen up your Summer for Less! 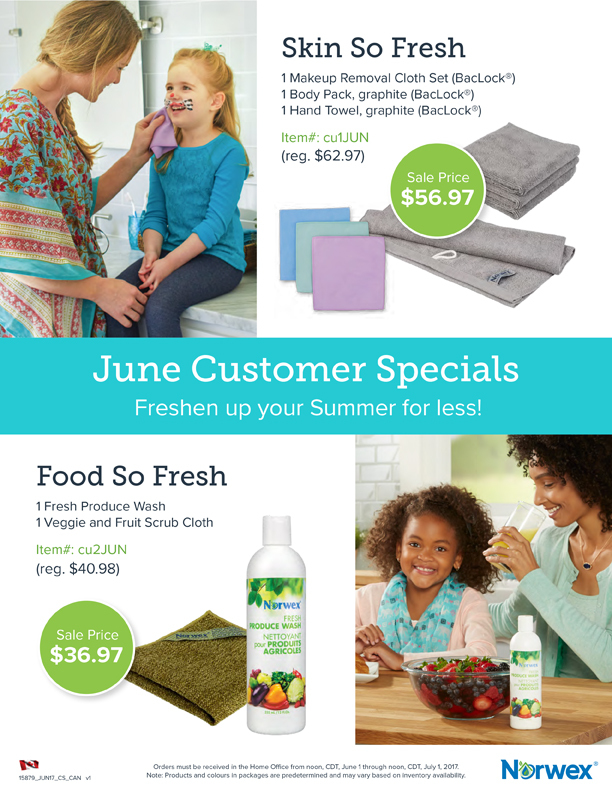 June Norwex Customer Specials. This month Norwex has put products on sale that help care for our skin as well as care for our produce. These products will help us freshen up our summer for less! We all know that caring for our skin, the largest organ in our bodies, is a worthwhile investment to maintain both our beauty and our health. 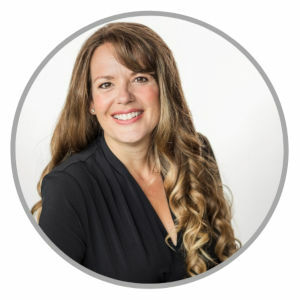 We also know that it is important to eat 8-10 servings of fruits and veggies every day while avoiding pesticides and preservative waxes that are found on produce. Norwex has some great products specifically to clean your skin and our produce without chemicals. Check out Norwex’s June Specials to see how you can easily incorporate another natural and environmentally-friendly solution (or 2) in your life. This special is all about our caring for our skin. It is a great package that includes both of Norwex’s skincare cloths. The first set is the Makeup Removal Cloth Set. Most makeup removers are expensive and harsh on the skin because the cleansing properties remove the skin’s moisture, leaving it dry and looking older. 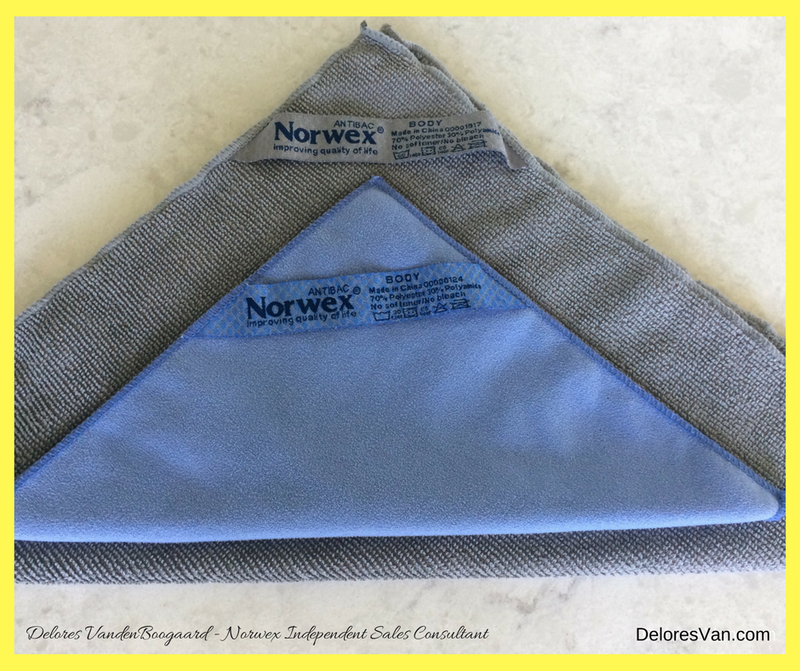 Moisten your Norwex cloth with warm water, and gently wipe your face upward and outward to remove makeup, eyeliner, and mascara without soap or cleansers!!! It is a soft, microfiber suede cloth with self-purifying properties of Baclock™ technology. The cloth is perfect for all types of skin, including irritated, mature, oily or sensitive skin. They are pure luxury. The second set is the Graphite Body Pack. These are super-soft microfiber cloths that also have Baclock™ agent and are perfect for your face and body and work to remove dirt and excess oils. When wrung extra well, these cloths work to exfoliate the skin and help reduce acne and blackheads. These cloths are intended to clean without soap, just pure water. The last item is the Graphite Hand Towel. It is beautifully designed to be gentle on hands, absorb tons of water, dry quickly and self purify because of the exclusive Baclock™ agent. Isn’t it time to freshen up the your wash cloths and hands towels??? 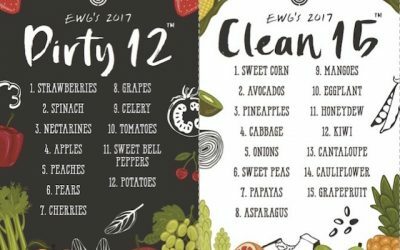 The Environmental World Group lists the top 12 dirty and the top 15 clean produce to educate consumers what fruit and vegetables have the most pesticide residues and the least pesticide residues which helps make informed decisions in the supermarket. It is good to have this information so we can choose to by organic, to limit our intake, or choose to clean our food better. 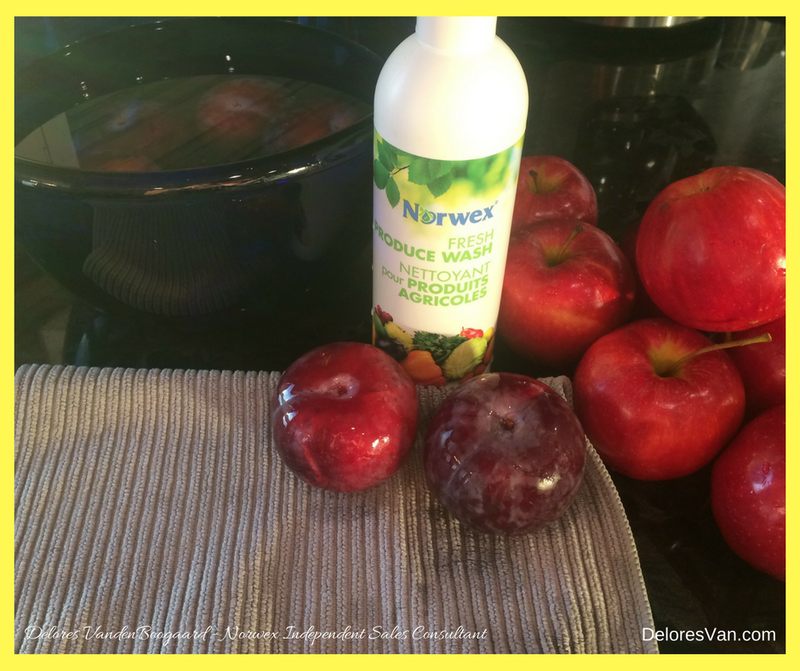 Norwex has two tools to help you clean your fruit and veggies. Whether you buy organic or not, it is important to remove dirty, debris, waxes/oils used to preserve our produce and pesticides to protect it from pests and fungal attack. Norwex has a two-sided Veggie and Fruit Scrub Cloth that works beautifully to scrub and polish. The rough side is for scrubbing away dirt, pesticide residue, debris and waxes, while the soft side polishes the peel. It not only makes your produce really clean – which makes the fruit to taste better and be healthier, it is durable and can be washed with your other Norwex cloths. It makes fast work of cleaning carrots, eliminating the need to peel them and is gentle enough to clean tomatoes and grapes without bruising them. Norwex also has a great Fresh Produce Wash that is a plant-based, biodegradable concentrate. Simply dilute 1/2 ounce in 2 cups of water and soak fruit and veggies for 2 minutes. Swish the water around and rinse. You will be amazed with the amount of residue that is left at the bottom of the grape bowl and how amazing they taste when they are really clean. Another plus is that this Produce wash helps extend the shelf life of your produce. Clean produce, no chemicals, no pesticide residue and longer shelf-life… sounds like a fantastic way to freshen your produce. Just one more customer special in June! 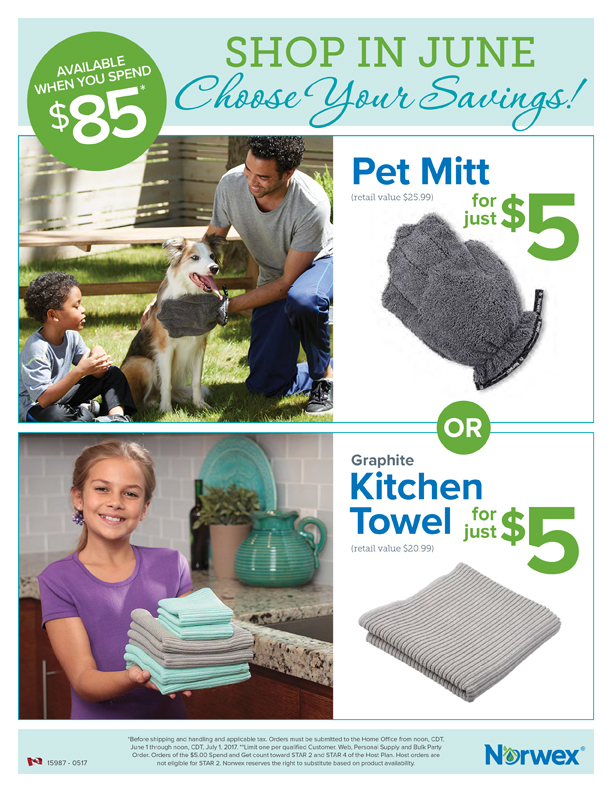 When you spend $85, you may choose a Pet Mitt for $5, or a Graphite Kitchen Towel for $5! Norwex’s customer specials will help you Freshen up your Summer Skin and Summer Fruit for less! Try one or both of our great specials this month.